1917 had been yet another period of frustration and stalemate on the Western Front. In Russia, the revolution earlier that year had all but removed her from the war. The German High Command, conscious of a depletion of British and French manpower, concentrated its forces in the West, their best chance of delivering a knock-out blow before American troops could arrive in overwhelming numbers. 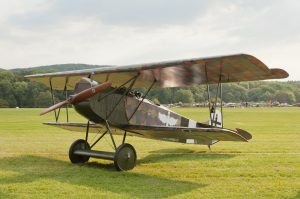 New German fighter designs such as the superb Fokker D.VII began to arrive in April/May 1918: it was ultimately destined to become the finest of all the WWI dog-fighters – WW1 AHT is delighted to have one of these aircraft joining its fleet in 2018. Most German two-seaters in early 1918 were considered superior to their British counterparts: among several new entrants was the LVG C.VI that supplanted the C.V and gave excellent service right up to the Armistice.